Total Cost: I’m not sure. One of the problems that I find myself faced with when I try to make, well, anything, is that there are endless amounts of possibilities in that one item. The colors. The details. Do I use buttons or zippers? Do I make it in grey scale, or pastels, or primary colors? In this case, I decided to make a little bit of everything. Something cute and creepy. Something pretty and creepy. Something using actual vintage lace and paper. Something mixing vintage and modern. Something that looks vintage but is completely new materials. So the cost? I don’t know. I have purchased vintage at many estate sales. I have bought new materials because they were just too pretty to leave in the store. This project is a collection of them all. Not very spectacular, I know. I’m still working on it. I need to make the doily more web-like, add my spider, and decide on the final placement of the butterfly. Since there is only so much space between the glass and the mat, I need to decide on what materials I will use to make my spider for this and some of the other pieces. I have some done, but am not happy with how they look. There is another image on the other side. I think it came from a children’s book. I don’t remember what the other rhyme is, but I liked the thought of having the child’s rhyme about the Black Death as a piece of art. Also, the colors of the picture go really well with the color of the frame. No really, they do. It just isn’t that apparent in this picture because of the poor lighting that I am working with. 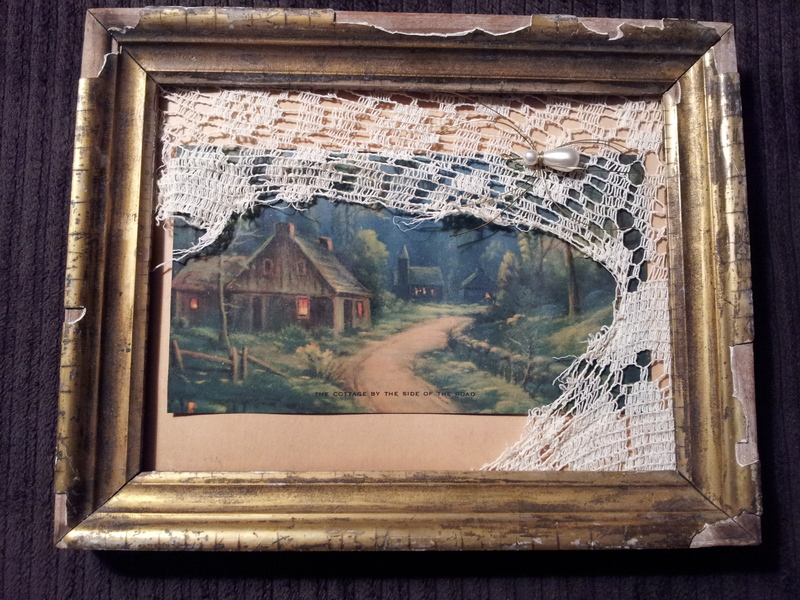 After I got all of the pieces paired with the frames that I could, I had a bunch of stained and torn lace that I could cut to fit the remaining frames that I had. I like this one because it reminds me of the Ford Theatre Reunion song “Tea and Cakes,” (http://youtu.be/O1a05trJpmE) which in turn reminds me of that short story that is required reading in high school English class. You know the one. The guy goes into the bed and breakfast, is poisoned by the sweet old lady who runs the place, and is stuffed, because her hobby is taxidermy and that is what she does to the people who visit her. Yeah, so I have a tendency to be a little morbid sometimes. Sorry about that. I know it can freak some people out a little bit. I just try to have fun with the things that pop out of my brain and not take life too seriously. Here is a close up of the spider since it doesn’t show up very well in the other picture. I’m still not 100% satisfied with how this looks and am considering adding beads to the legs so they show up some more. Thanks for reading! I hope I haven’t scared you away.